The flows have dropped to 613 cfs I have not seen anything to different from last week as far as insect activity. I will be watching for Mahoganies and expect to them sooner than later. Trico’s have been great in the mornings followed by Honey Ants. It’s cool seeing these fish in pods on the ranch. If you can get away for a couple of days then get here! I would have #20 Trico Two Wing Spinners. I like this pattern because you have a chance of actually seeing it on the water. I would also suggest #16 Henry’s Fork Honey Ants. Look for these ants to make an appearance from 10:00 Am throughout the day. I would also have plenty of your favorite hopper pattern on hand. I like Henry’s Fork Hoppers and Rainy’s Hopper. 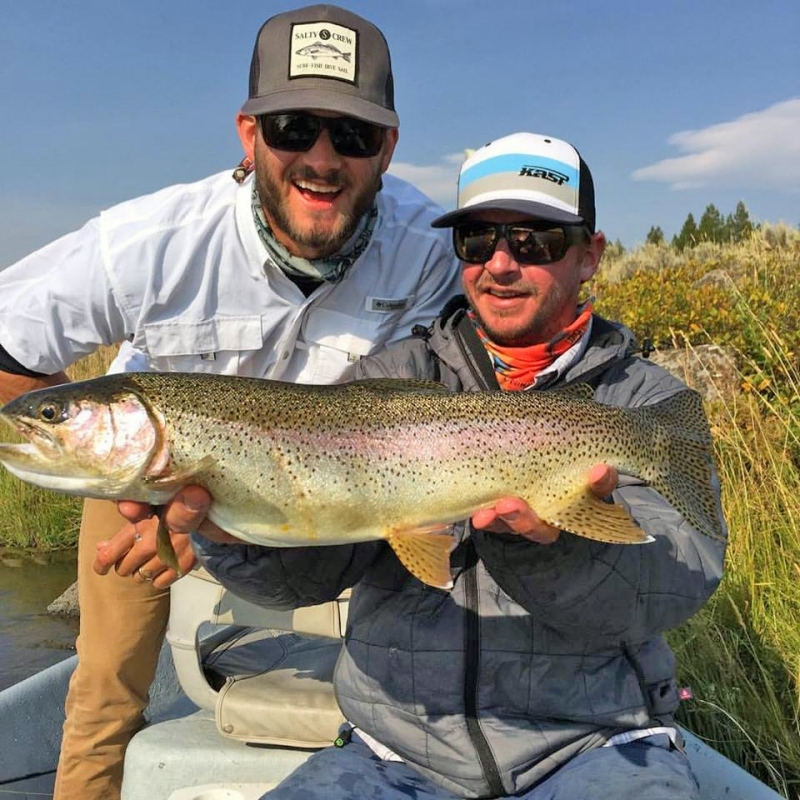 I think the Ranch section of the Henry’s Fork is the place to be right know and I can tell you it will just improve as we head into fall. The Box Canyon has been a little tough this week as the water has dropped. it is still very float-able but it seems as the water in the box drops it takes the fish a day or two to adjust. The water is a little off color but I think by the this weekend the box should be fishing just fine. Warm River to Ashton as always is a great place to find fish! It may be a whitey, it may be a smaller trout. 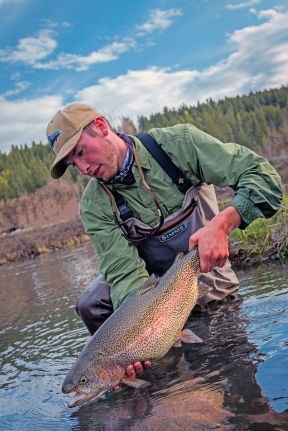 You may also find yourself tied into a Brown Trout of a life time! Pick your poison on this stretch of river. This really has been a great summer for hoppers! I would have a #6 More or Less Hopper in tan or yellow. A small bead head under your hopper is a good idea. I like the red #16 Zebra Midge. I also would have #16 and #18 Pheasant Tails as well as #18 Rick’s Tungsten. 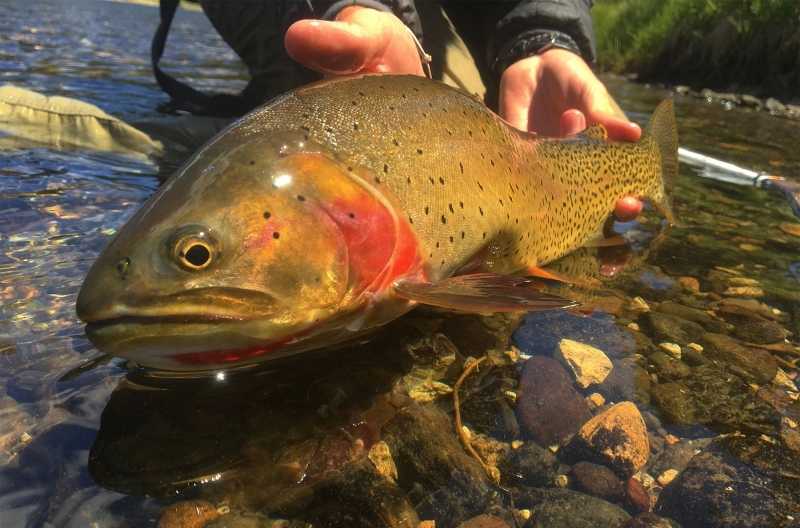 If you’re looking to get your dry fly fix satisfied remember early and then again late is your best bet. The Upper Teton is the place to be. The fishing has been very good on the upper stretches and the rubber hatch has also slowed down a bit. We have run a handful of guide trips on the Teton this week and have had some great success. A #8 Rainy’s Hopper has been working very well. As always have a good supply of small bead heads. 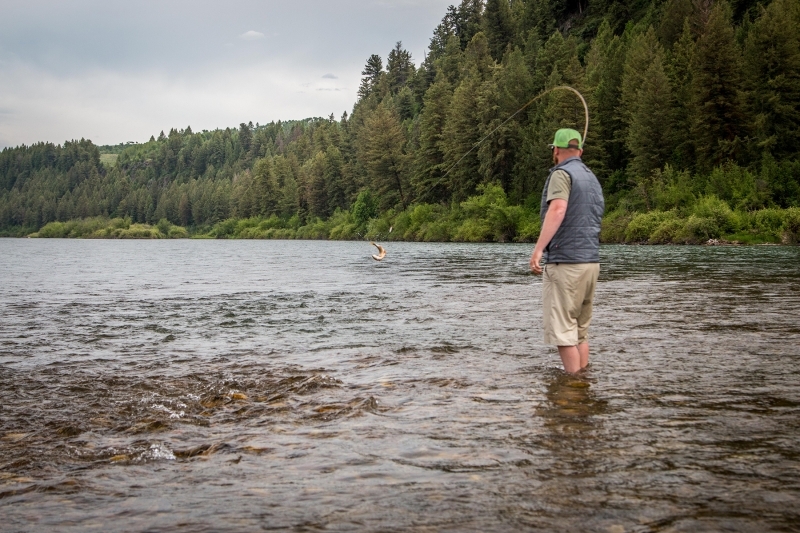 Look for the lower Teton to pick up as water demand drops this next month. 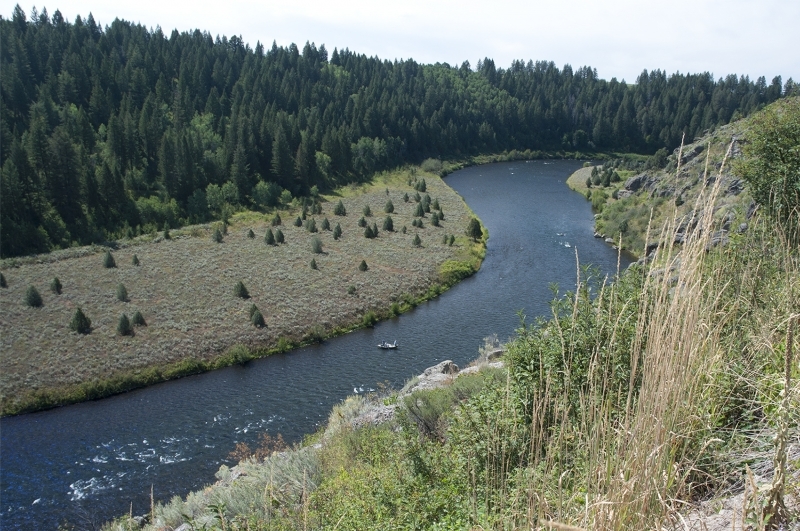 The South Fork this week continues to fish very well in the early morning hours. The Mutant Stone flies are in full swing. The Canyon is the place to be. If you miss the early morning game then you may have to run some nymphs. The Hopper/ Dropper combo has been very effective on the South Fork. I am a big fan of Rainy’s Hopper on the South Fork. As far as your beads heads go I like #18 or #20 red or black Zebra Midges. There are plenty of Pink Alberts in the riffles. Keep in mind that they are smaller this time of the year so fishing a #18 pink No-Hackle in the riffles will serve you well. Also if you find yourself on the water in the evenings I would fish caddis. Mike Lawson’s Partridge Caddis Emerger is one of my favorites on the South Fork in the evenings. 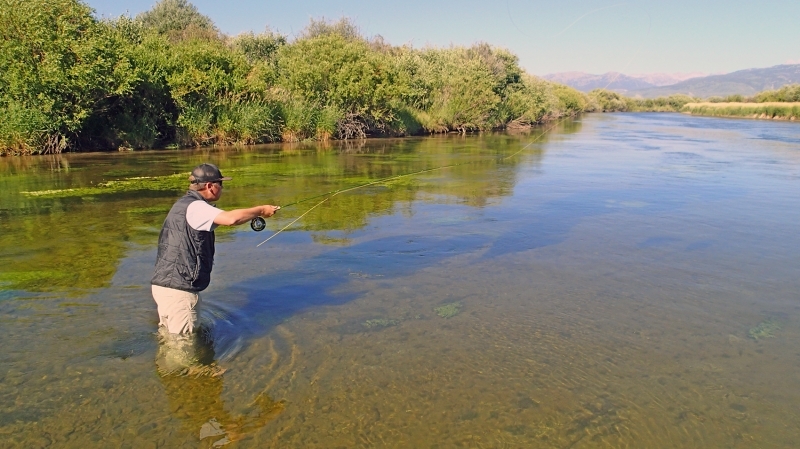 Try swinging a #16 tan Partridge Caddis Emerger through riffles or along banks that have fish actively feeding. Another one of my favorites is a #16 Partridge and Orange Soft Hackle. I don’t have a lot of new information for the Madison River. The early morning and evening fishing continues to be very productive. I would have some smaller beetle patterns for midday fishing. I would also have #16 Adams and #16 and #18 Purple Haze. Fish are also starting to eat hopper patterns better so fishing #10 and #8 yellow Morrish Hoppers is a good idea. An early morning streamer run on the Madison is also a great idea. The South gate of the park is open again and some of the fires are contained. Plan on seeing fires in the park until winter sets in. The Yellowstone river in the park remains open at this time with no changes to the closure of the river outside of the park. The road and the camp ground into Slough Creek remains closed as of today. I usually get updates from the park once a week so when its open again I will let you all know. The Lamar has been fishing very well this past week. A #16 beetle will serve you well on the Lamar. Henrys Lake has been very tough this week. Also keep in mind that the Blue/Green Algae has arrived so don’t drink the lake water! While it’s not harmful to fish or humans, it is very harmful to your pets so if you’re planning a trip to the lake you don’t want to let Fido near the water. Hebgen gulpers are still going great in the mornings.